Relax and rejuvenate on a 3-day winter wellness escape to the remote countryside of West Iceland during prime Northern Lights Season. 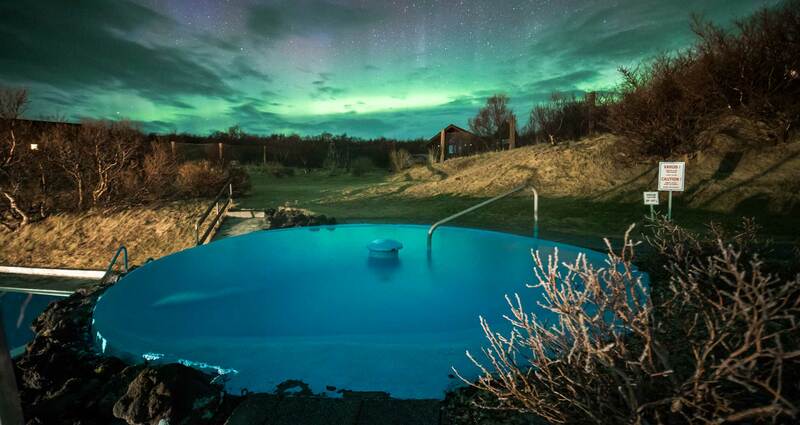 Rejuvenate in the warm natural baths at Krauma, Iceland's newest hot-spring hot-spot. Experience Float water therapy at Húsafell thermal pools. In the evenings hunt for the Northern Lights in the night sky of Borgarfjordur, with an average of three sightings per week during winter. Don’t forget to request your free Northern Lights wake-up call using our new automated Aurora system, the first-of-its-kind in Iceland. If "active" recharging is more your thing, add a snowmobile or ice cave excursion to nearby Langjokull Glacier. Into the Glacier and Vidgelmir Lava Cave tours depart daily from Hotel Húsafell. Ice Caves and lava caves bookable upon request and at extra charge. *** Although the Auroras can’t be guaranteed, chances of sightings increase by staying 3-4 nights under the dark skies of BorgarfjordurValley away from all light pollution.